My very first pen show, and I made it all three days, even though I worked Saturday and Sunday nights (and was asleep most of the daytime, thank you night shift life), I still brewed up extra coffee, woke up early (for me), and made my way over. The only other kind of major convention I’ve been to before is an anime convention. The main difference is that no one here was dressed up as a pen. 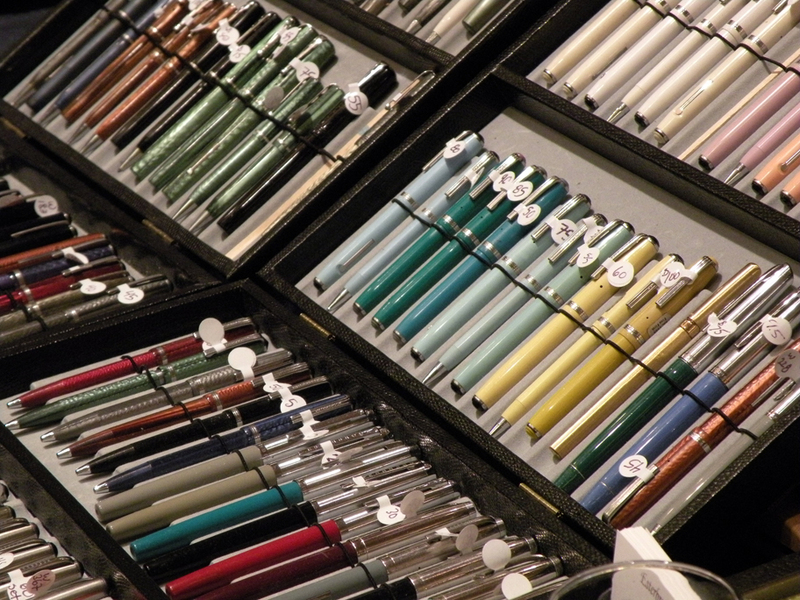 It was great meeting other pen enthusiasts in person—usually I am otherwise skeptical when someone in person shows interest in the office supply world. I make a very good attempt at raising one eyebrow, and ask in my most dubious voice, “Are you sure you really want me to go on about this? Don’t lie, because I will go on at great length. The full wrath of my pen-ADD will be unleashed upon you.” But here was a whole room full of nice people who also like to talk about pens! It was like living inside the internet. The pen holder/binder/whatever this is called, along with a pack of purple Sheaffer cartridges (not pictured, except for the one inside the wee Sheaffer pen) I picked up from the booth of Bertram’s Inkwell. 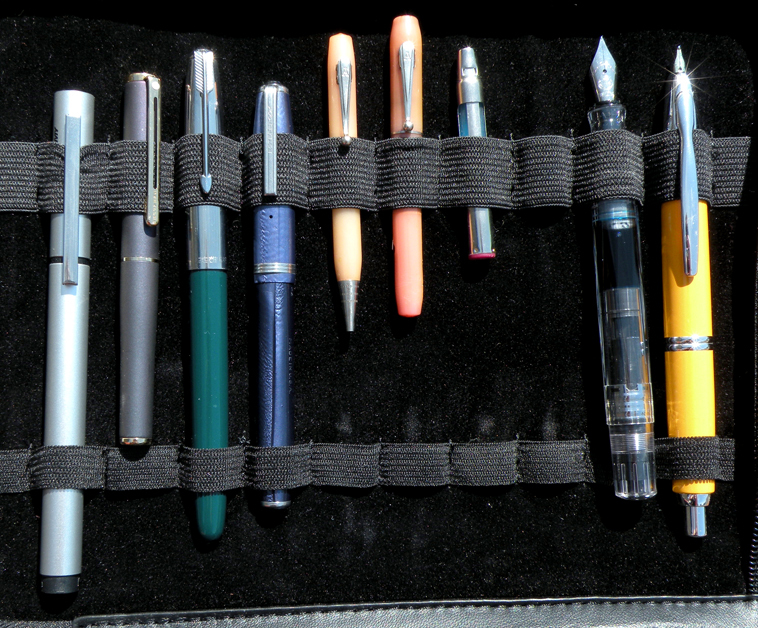 The Lamy Pur EF nib fountain pen to the far left (and the Clairefontaine notebook in the previous picture) both came from the booth of my local pen store, Office Supplies and More (I’m still trying to convince him to have an online presence, still to no avail). The two tiny coral-pink items are a lead pencil and fountain pen set by Arnold’s of Petersburg, VA. They are alleged to be from 1825…which I’m going to have to call horsefeathers on, as I’m pretty sure either the plastics or whatever material these two are made of weren’t available in 1825, OR (/and) lever-fill fountain pens didn’t even EXIST in 1825. It’s very clearly written on the price tag, but maybe whoever did this meant to write 1925 and had a moment. Alas, I forget the name of the booth where I got the Arnold’s mini set, but it was only $25 for the both of them (and I don’t know a blasted thing about antique pens, so that sounded good enough to me, especially considering they are both in working order). Beautifully overwhelming quantities of pens everywhere. 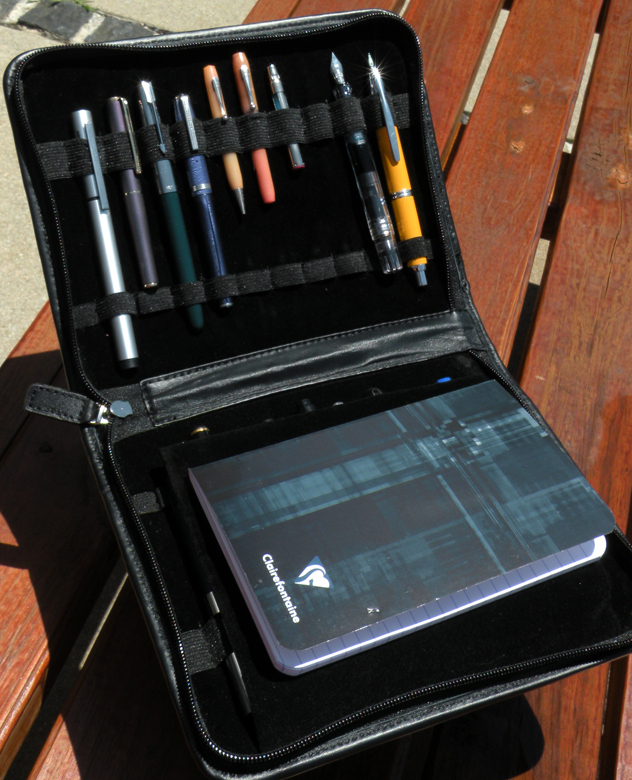 I wonder if my pens would look this awesome with dramatic lighting and majestic-colored resting spots in wooden trays. The little iridescent-purplish Sheaffer pen and the blue Esterbrook (and the Sheaffer converter, which I apparently decided was worth including in the picture) all came from the above collection of one Arthur D. (Dan) Reppert. I’m thrilled with both of those pens, and I’m especially happy with my very first Esterbrook. Clearly I will have to look into Esterbrook more. I finally got to see some Snorkel pens in person! And even though I didn’t buy one (it’s going on the long-term want list), I did pick up a Hero 616 from Martin‘s booth. He’s a cool guy who understands the importance of good paper and the dangers of Private Reserve fountain pen ink. Like talking to a brain mirror. Being still almost completely clueless about how things work in the vintage fountain pen market, I tried to keep myself from getting sucked in too deep (read: buying too many / too expensive pens), so I was thrilled to see TWSBI pens and accessories. My TWSBI up there is still the same ole Diamond 530, but thanks to Anderson Pens it now has a brand-new fine nib, and an ink buddy. 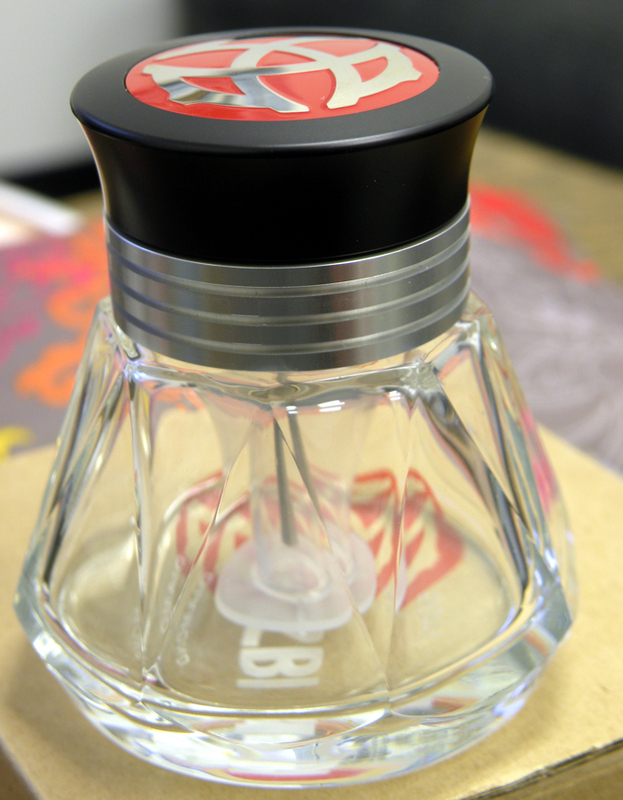 The silver will match any ink color I decide to put in there. Pen accessory and ink coordination is a fine art. You may recall my early vexation with my otherwise lovely Pilot Vanishing Point—so it was no contest as to which pen I’d pick for my very first customization of a nib. What was once finicky now freely flows, and it’s incredible! Richard Binder is truly a god among pens. And finally, I had the wonderful opportunity to meet Alan Shaw, and explain to him the as-yet-fruitless grail quest I’m on for the perfect, dark-purple-bodied fountain pen. Since he is a maker of custom pens, and I am in search of a custom color, well….let’s just say…there’s a good chance I might be getting into my first custom fountain pen here in the future! He’s got a lot of custom pens with really creative materials. If I made business money, there was a pen of his there with huge bird feathers in clear resin that I would’ve snatched right up. Why I didn’t take a picture of it, I don’t know. To instill regret in myself, I suppose. 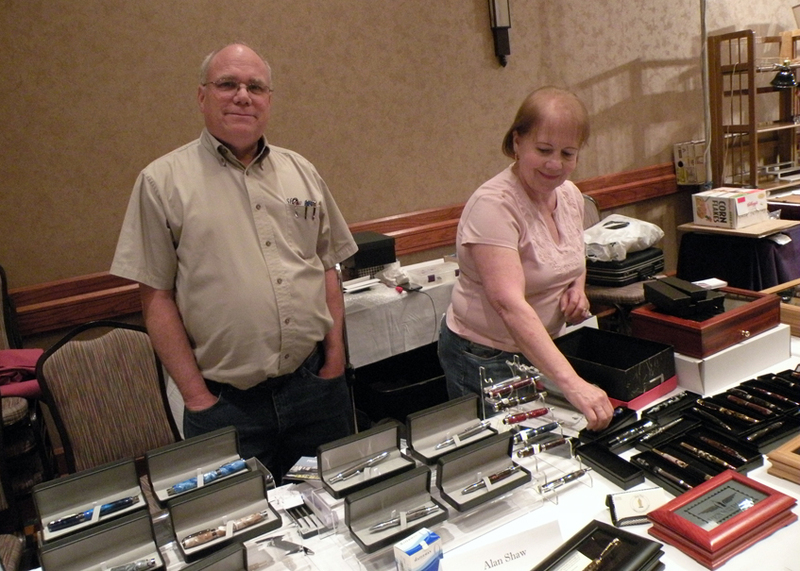 All in all, a very fun and exciting first pen show! Now I need to start plotting out when the other East Coast pen shows are, see if I’ll be off. I’m hooked now. You said it right – it was almost like living in the internet. 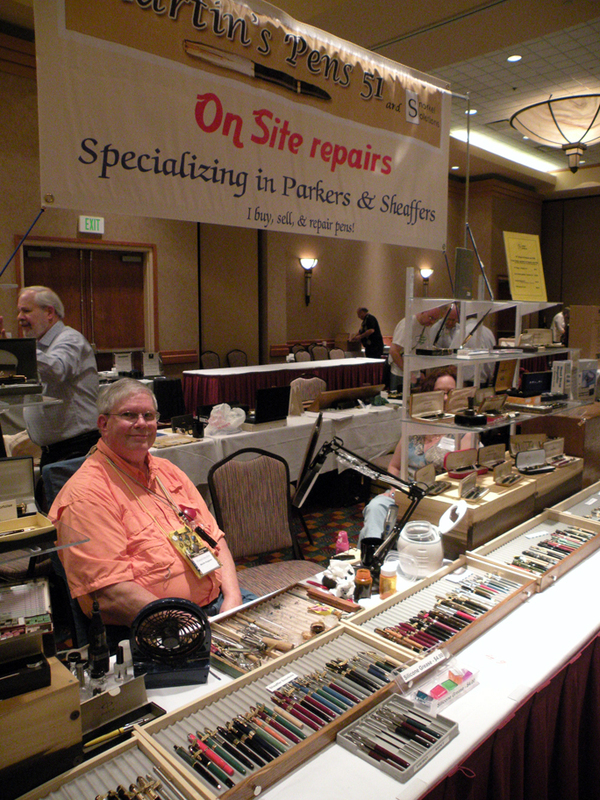 And Richard’s work is amazing – I left not only with the regrind I’d wanted on my Edison, but also a couple of italics (one fine, one REALLY fine) attached to some M215s – before the show, I had no idea I could even write with an italic. btw, I really enjoy your blog and your artwork. I know there were some FPN and other people there I’d have liked to meet, yourself included, but maybe next year. Hopefully my partner and I will make it there on Friday night this time – that hotel was pretty nice to a pair of plebeians like us! Next year I’ll try to be more coordinated about it! 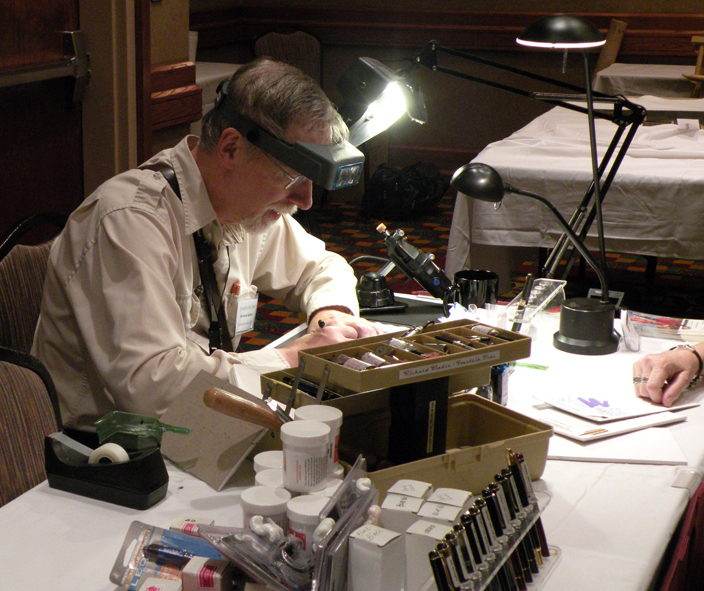 I’m hoping to possibly get to the DC pen show this year as well. Wow! 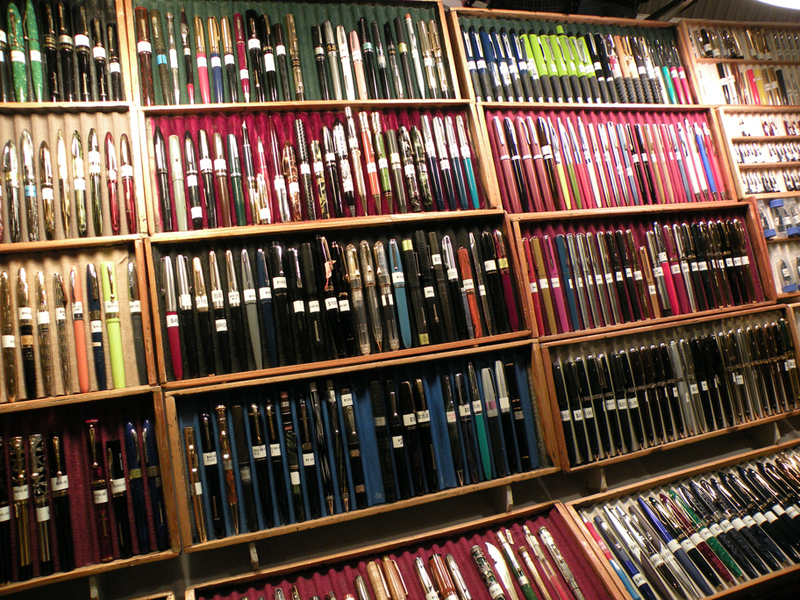 The rainbow walls of pens…drool. Did you find your eggplant colored fountain? Your posts have kept me hooked! 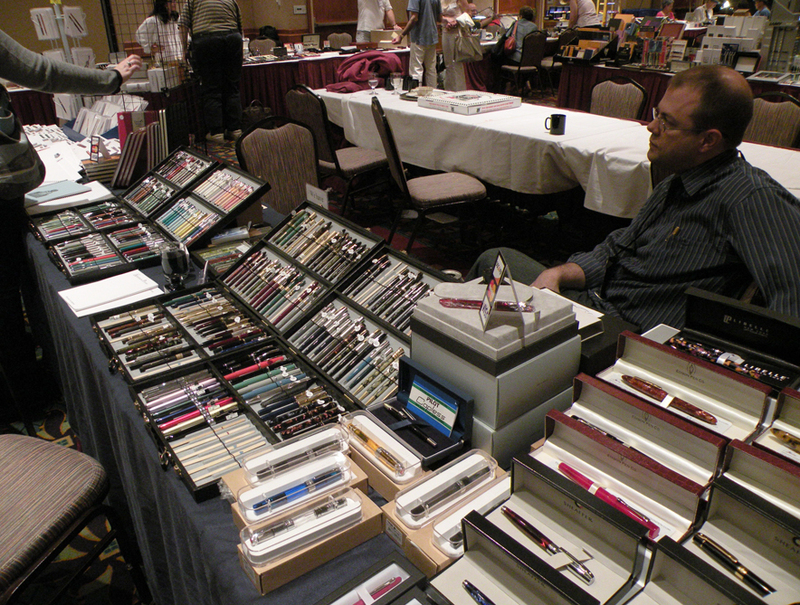 I just recently attended my first pen show (DC) and the experience is amazing. Thanks for sharing your adventure! You were at the DC show?? It was even bigger and better than Raleigh by far! Get anything good? Just you, the fli and whatever you and your friends and family are getting up to today. enough that they help you stay motivated. It is a horrible trap that thhe kids are in,” Arngrim said.